Richmond, Va. (June 1, 2011) – Glavé & Holmes Architecture has been named the 2011 Palladio Award winner in the New Design & Construction category (more than 30,000 square feet) for their design of the new Carole Weinstein International Center at the University of Richmond. The Palladio Awards are a national program that honors outstanding achievement in traditional design. Glavé & Holmes is one of only nine architectural firms in the country recognized by the 2011 Palladio Awards Program. Celebrating international education on a campus that is renowned for its International Studies program, the design of the Carole Weinstein International Center was inspired by the academic mission the building serves and the surrounding campus. 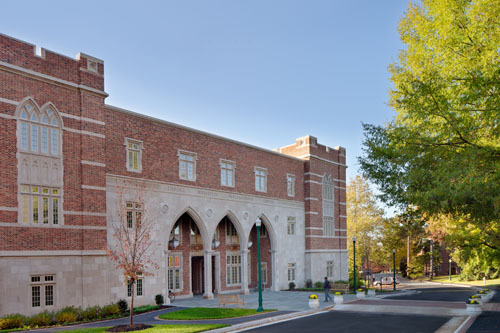 The 56,194-square-foot Collegiate Gothic building represents a resource for study-abroad initiatives, a home-away-from home for international students, and a forum for the larger community to exchange cultural experience. In addition to housing the Office of International Education, the building hosts the departments of Geography and the Environment, Latin American and Iberian Studies, and Modern Literatures and Cultures, as well as interdisciplinary programs that address global issues. The building’s design incorporates global cultural elements such as rosettes depicting traditional West African symbols for peace, truth, understanding and other virtues advocated by the building mission. An open-air courtyard was selected as the central organizing feature of the building because of courtyards use in architecture throughout most cultures. The scale of the courtyard and its visual connection to second floor balconies promote an intimacy for the multi-use central gathering space. A columned arcade surrounds the courtyard, with the primary public spaces (Commons, Café, Gallery, and Office of International Education) opening onto the arcade. The courtyard’s paving is patterned in the form of a mandala, an iconographic traditional art form referencing ideas of Center, Universe and Harmony that are shared by many cultures. It features bluestone pavers with accent stones from 48 countries and a globe sculpture fountain. The building embodies the University’s commitment to sustainability and is a candidate for a LEED Gold Rating. The center’s technological backbone facilitates collaborative teaching and research between Richmond and partner universities in other countries. Live satellite links permit faculty and students in Richmond to participate virtually in lectures and courses at universities outside the United States, as well as engage in real-time discussions with counterparts around the globe. The Palladio Awards are sponsored by Traditional Building, which is published by Restore Media, LLC. The Awards are named in honor of Andrea Palladio, the Renaissance architect who created modern architecture for his time while using models from the past for inspiration and guidance.